respec for GF whirl barb? Discussion in 'Single Player Forum' started by SnickerSnack, Jul 20, 2010. I leveled a singer to 79 the hard way. No MP (as I recall) and no multi-instance help. So, now I have a decent gf singer. I also have an eth Oath scourge (not 1.07) and a Stormlash, but I think the damage output on the swords is much higher. Among the swords, it looks like Oath/Oath hits 2fpa and Oath/Death hits 3fpa, but the Death damage (and 50% CB!) seems like it might make up for it. 2nd question: in your collective experience, which will be better (for gold/rune finding in trav)? Of course, Glacial Spike can shattered corpses. I also have some other nice melee items, like Fort, Duress, Highlord's, String, Dungo's, Gores, Arreat's, and others. The only trouble I'm having is that I can only respec this character once, and he has an awesome GF name: Cortez*, so I'd really rather do it right the first time. Opinions? * Of course, I can always delete him and remake. It's not that hard to level a whirl barb. On a related note, I've thought of respecing my meteorb and executress and swapping their skills. In effect, I gain a level 90 enchantress (and I was thinking of making her an enchantLess heavily invested in energy shield instead of Forb) and a level 80 meteorb (which isn't too hard to level up). The gain is that I don't have to level my executress. 3rd question: is there an SP forum consensus on how cheesy this is? I'm reluctant to do such things only because I often choose fitting names for my characters: Clytemnestra for an axe enchantress, Cortez for a gf barb. Re: respec for GF whirl barb? On the subject of "Death:" I know sirpoopsalot preferred Death in the off-hand for his sword/sword GFer char (Grief PB main hand), and I found Grief BA/Death BA to be the best setup I had available for mine, so I imagine Oath/Death will work just fine. Glacial Spike won't proc with WW, so that's not an issue. Most of the most efficient runners in the Piles of Money "Tourney" were weapon/weapon whirlers, so I wouldn't see why it wouldn't be a good choice for you. I know GibCouncilGrief was very strong Gold runner for me, using Grief/Death Cleaver and then later Grief/Death. Swords seem to be a little weaker overall, but should still do absolutely fine. As for whether it'll be fun: obviously that depends. Running the Council with Gib was one of my favorite things I ever did in D2, but some people hate it. On the subject of "Death:" I know sirpoopsalot preferred Death in the off-hand for his sword/sword GFer char (Grief PB main hand), and I found Grief BA/Death BA to be the best setup I had available for mine, so I imagine Oath/Death will work just fine. Great. I guess sirpoops decided that the extra damage was worth the slower speed. Does a death BA have a slowish speed? Was that something that was overcome by the bonus damage, for you? Glacial Spike won't proc with WW, so that's not an issue. Oh yeah...why do I always forget that? I also have a gf necro who has a very nice Dur2 map. He can plow through Trav and Dur2/3 in about the same time that my singer can get through trav, so the singer is a bit redundant. The necro is fairly fun though. I'm hoping to improve on a singer barb, which is a bit boring (just spamming warcries). It was a....unique experience to level him, but now the novelty has worn off. I would suggest that you run the council for runes with some GF, not go 100% GF. Optimise for killing and, as you look for runes, you will get all the gold that you need. I ran Council with a single Death Colossus Sword to good results. The CB and DS absolutely rip them apart. Keep in mind that slow weapons only decline after frame 8, so with a point in Increased Speed, FRW boots, and a source of CBF, you can keep you WWs short and not notice much difference between a fast and slow weapon. And maxicek is right... Rune drops are better than gold drops. Whirlers can't carry a ton of GF without neutering their speed. With a pair of 'LemLem' Ali Babas on switch and a Gheed's in your inventory, the gold horks are still pretty impressive at P3. In my opinion, the respec thing is a little cheesy. I try to only use it to optimize or fix mistakes, not change from one build to another for the purposes of faster leveling. That being said, you can always farm essences for more respecs if you need them, and you can always change your characters' names via ATMA. Definately go weapon/weapon. Great fun to whirl through those council. 871,004 gold - one run. 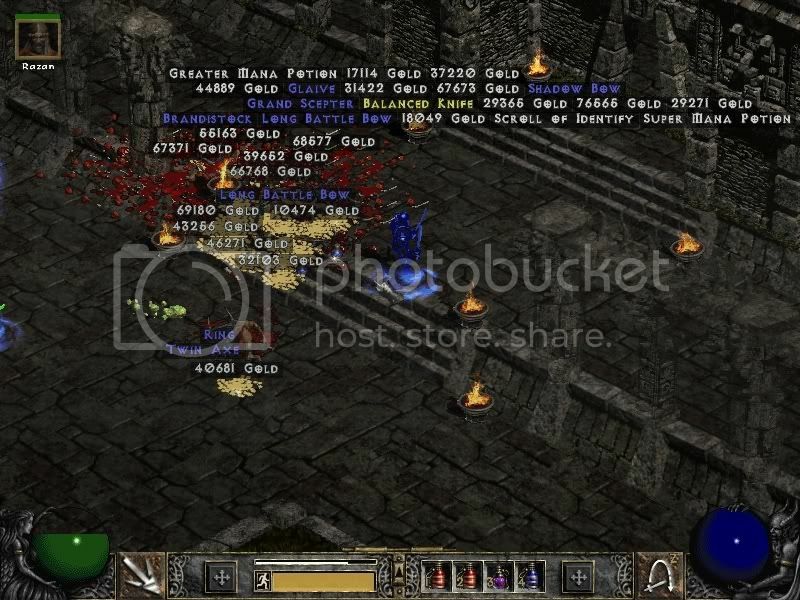 I think there is plenty of useful advice of sorts in the Piles of Money Tourney thread http://diablo.incgamers.com/forums/showthread.php?t=710241 as well as in zerth's and other's writeups there. Those were of course focused entirely on gold- a better balance of GF and looking for other drops like runes as maxicek suggests is an excellent idea. Now I'm off to respec my barb and try out the Oath/Death. I ran Council with a single Death Colossus Sword to good results. Oh, so it was held 2-handed? Interesting. I'll have to try that as well, I guess. Yeah, I'm probably not going to swap characters. It's too cheesy. I will fix a few things, like changing my max block meteorb to max vita. On-weapon mods like DS and CB only function for that particular weapon. So you aren't gaining any benefit to your Oath from the juicy stats on Death. With the CB it isn't such a big thing since that will be the same whether you use the Death one or two-handed, but the difference with the DS is massive, being essentially double the damage. I'm a bit of a minority on this thinking though, most (sane) people don't consider using a weapon for WW unless it hits the last breakpoint. So, the fastest you can get with a Death is going to be half the speed of an Oath. In my opinion, it really seemed like the DS and CB on Death made up for the slower breakpoint, considering your first two hits are "free". I ran at P1 though, not P3, since CB doesn't scale with monster health, being effectively halved at P3. My Death experience was somewhat limited though, since I got the second Cham I needed relatively quickly and shelved it for my BotD War Pike. I'm listed in the table there, but you'll notice that I never posted any runs. I never really felt like running for 30 minutes solid, and the high scores are so good.... Zerth has already shown that a singer does very well with good gear. For now, I'm more interested in runes, so I think I'll stick with runes for a while. Though, I might try regearing for gf and running on p1 instead of p3. I've probably only gambled ~50mil gold, but I've had my fill of it for a while. On average, the damage outputs are probably similar, though I'm not too interested in working it out precisely. I'm running at p3 (with Oath/Death), and it's been pretty easy. In about 15 runs, the merc died a few times, and I had to retreat one of those times. I'm considering even running on p5 (with Oath/Death). But, I'll give the 2-handed Death a try. Anyway seems i cant hit the poor councillers enough to leach decently..
what kind of Str/dex/vit you are using? he has enough dex for his cyptic sword oath if he gets 10 dex from somewhere else (eg Wealth). I've done a few runs with just the Death Colossus Blade in 2 hands, and it seems to work just about as well as Oath/Death. Not much difference, really, though that's just my impression, not anything carefully measured. Well, Death alone is a bit better against mana burners due to the mana leech. merc: reaper, kira's, eth guardian angel. I tried different armor on the merc, but the guardian angel keeps him alive pretty well as a lot of the damage he takes is fire from the hydras. His AR is around 6.5k, but before he used the metalgrid, he used a demon limb to prebuff, which took his AR over 8k. At level 79, I had him running Trav on /p3. He's now level 82 after a couple dozen runs (and a forge collection). What gloves and amulet are you using? Dracul's Grasp might help you leech if you're not going to use Reaper's on the merc. Heck, you could even go with a combination of the two. Remember that since level is involved in the to-hit calculation, you'll hit more often as you gain a few more levels. Dual Oath should be fine, though Death has some very nice mods (50% CB and 40+% DS after level 80). Okay, so i've done another 50-60 (more? I'm not counting) runs using the Death CB. I like it. One of the main benefits is that when I have to use Berserk on Ismail, I swing the Death since that's all he's holding; when dual wielding, he swung the Oath, which, while faster, doesn't do nearly as much damage as the Death CB held in two hands. PI Ismail goes down in about 4 satisfying thwacks (/p3). From charms: +26 max, 652 AR, 185 life, 6 dex, 4 str, 22 light res, 10% fhr. I plan on replacing that ort with a Ruby Jewel of Wrath for more Fire res so he'll die less quickly under Conviction. I have other ruby jewels, some with life, so maybe I'll also socket his Kira's? I've been thinking about ways to boost AR even higher (it's about 8k right now, no enchant). I used to use enchant, but that kind of eats up time. I'm thinking of trying it again, but I'm also considering swapping some items around. I'm think of putting an Argent Jewel of Carnage in the Arreat's Face. Right now he has 70% fhr, so dropping 20% will leave him at 50%, so he keeps the same bp. But, I've been thinking of swapping in a String of Ears, which doesn't have fhr, in which case I'd need to find some fhr somewhere else. Right now, he has extra fhr, so swapping out the verdungo's is fine. I'm not sure if this is a worthy use of a pretty nice jewel. I don't know if it'll really help that much. If I have to get more FHR, then it'll probably have to come from charms, which means taking out a sharp/life or a steel/life GC or some steel/str or steel/dex scs. Hmmmm, increased max fire res AND 20% fhr. If I boosted my max fire res, I could easily ditch the Dwarf Star in favor of something with more offense. But, I lose a big chunk of AR (438) and a chunk of resists (28). Well, I have 6 skill points saved up; I could dump those in Natural Resist (currently at one point), and I could work it so that I really only "lose" about 200 AR. Swapping the Jewel, the Amulet, the Belt, and the Ring would net me 11 max damage, 7% life leech (not too needed though since I already have 12%), overstacked Fire res (to guard against Conviction a little better), and whatever else I can get on the new ring. It does cost me ~200 AR, which I think *might* be okay since he has almost 8k right now with ~80% chance to hit on the LCS (he's level 86 btw). It costs me some fire absorb, which may be about equivalent to the raised max and overstack I gain. Edit: Of course, I could just use the Angelic combo. My advice would be to get rid of Verdungo's. I love this belt, I really love it, but it has no place on Travincal WW barb. String of Ears is better in any way. I have SoE on my WW barb and I wouldn't trade it for anything. Leech, coupled with Areat's face fixes life leech, you can get up to 15% DR like on Dungo's and on top of that you have Magic Damage Reduced by 15. This really helps with Hydras. Also for merc, MDR is great way to fix those annoying Hydras. I use Reaper's(Amn), Gladiator's Bane(Ort) and Vampire Gaze(Ral). Mercenary is very durable, I don't remember when he died last time (we are talking months here) but I don't do Travi runs too much. Dwarf star is also overkill, sure it adds some nice Hydra negation but I'd call it wasted ring slot It's possible that from my point of view Travincal has become child play since I have Grief/Beast and they are melting without even me trying so I don't have to focus on safety (4700life, 60 fire resist, 15 MDR is safe enough for me ). And yes, take that Shael out. It's useless on WW barb. Argent Jewel of Carnage should really be best choice here. I put the argent jewel of carnage in the helm, and I replaced dungo's with SoE. I haven't bothered with rings yet, but I guess I'll just get AR and life from them. I think I'm going to have to actually calculate accurate to-hit rates with various gear. Switching from metalgrid and some AR charms to the angelic combo, the LCS only went from 80% cth to 83% cht. If the benefit is actually about that much, then it's not worth it. Right now, I have Highlord's Wrath in the amulet slot. It raises his chance for double damage from 72% to 93%, which I interpret (correctly?) as a 29% increase in damage per hit. It also gives about 250 AR on the LCS due to the +1 skill (and another 1% horking). Needless to say, I'm having trouble optimizing. =P Survival isn't really a problem. I think I've only died twice in about 100 runs, and the merc only dies when conviction is involved (but that should be fixed once I resocket his gear).